Captain Cory Hardiman is a 26 year veteran with the Birmingham Police Department. After graduating the academy in 1992, he began his career at the North Precinct where he worked as a patrol officer from 1992 to 1996. In 1996, he was assigned to the Burglary Unit where he worked as a detective for six months before transferring to the Homicide Unit. Captain Hardiman worked as a homicide detective until he was promoted to the rank of Sergeant in 2002, at which point he was assigned to the White Collar Crime Unit. In 2005 he returned to the homicide unit as a supervisor until his promotion to the rank of Lieutenant in 2008. As a Lieutenant, Hardiman was assigned as the commander of the Forensic Unit until 2011, when he was re-assigned as the commander of the Robbery Unit. 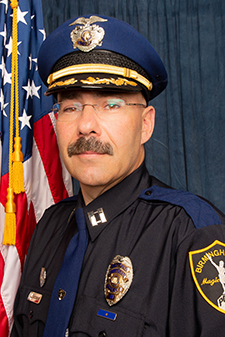 Captain Hardiman was promoted to the rank of Captain in 2013. Since his promotion, Captain Hardiman has served as the commander of both the South and West Precincts. In 2016, Captain Hardiman, was assigned to the Deputy Chief of the Field Operations Bureau’s Office as the Assistant Bureau Commander.